The intact stomach, first part of the duodenum, and omentum are brought over the left side of the transverse colon. 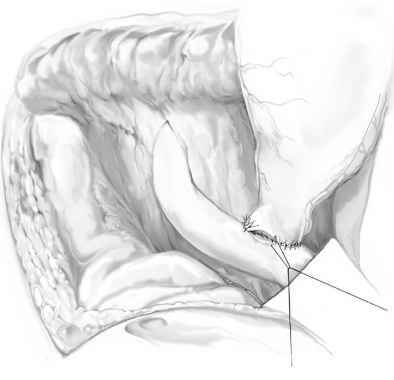 The jejunal limb (after it exits the transverse mesocolon downstream from the biliary and pancreatic anastomoses) is brought up to the end of the stapled duodenum, and an end duodenal-to-side jejunal anastomosis is performed in two layers 10 cm distal to the exit site of the jejunum from the transverse mesocolon. 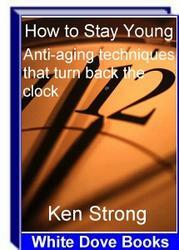 An inner layer of running 3-0 polyglycolic acid and an outer layer of interrupted 3-0 silk are put in place. A 15-Fr. 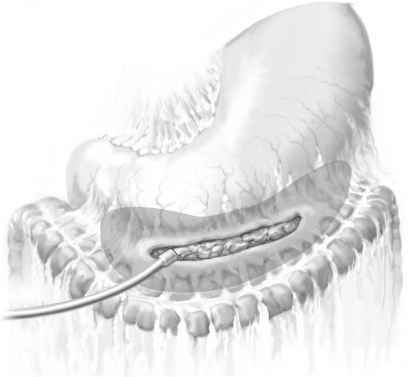 drainage catheter is placed under the biliary and pancreatic anastomoses from the right upper quadrant. The midline fascia is closed with an interrupted figure-of-eight 0 polyglyconate suture.